My Little University aims to partner with parents in fully optimizing the potentials in their children. By 18-24 months, children progresses more rapidly, learning more about his environment and even more about himself. By this time, separation anxiety could be at its peak, making it more difficult for parents to leave toddlers at home or in school. But work-arounds can be made since this is also the age when they enjoy having company the most. 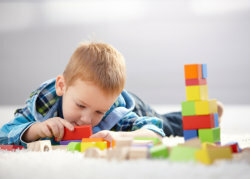 They also rapidly enhance their brains creative side through imagining things especially during play. My Little University provides your toddlers the perfect place to develop their imagination. Our facility has been safely and creatively designed to give children an environment where they can pretend play on their own or engage joyfully with playmates. My Little University highly monitors the progress in each child so you can be sure that your child will not be left on his own, learning at a delayed pace. We make sure that we are there to help each child reach his maximum potential through our programs and facilities here in My Little University.